I was honored to be in the company of some excellent retirement writers recognized in a recent article in The Wall Street Journal, “My Favorite Writers on Retirement Planning.” Since I started writing this blog in May 2011 for the Center for Retirement Research, which is funded by the U.S. Social Security Administration (SSA), retirement writers have come out of the woodwork to help the swarms of retiring baby boomers – and many of us need it! Others featured in the article by the Journal’s Glenn Ruffenach – some new, some veterans – include financial planner Michael Kitces, whom I’ve interviewed about tax strategies for retirement plan withdrawals. Most everyone knows Jonathan Clements, a former long-time Journal reporter now editing and writing a blog. Last but not least, I’ll mention Mike Piper, a certified public accountant – someone new to interview! – and Christine Benz of Morningstar, a Chicago firm that is a long-time source of data and information for this blog. Baby boomers have limited time and only a few options to improve their financial prospects when they retire and give up a regular paycheck. Millennials have more time to do something about it. They should start thinking about it, indicates a study by the Urban Institute’s Richard Johnson, Karen Smith, Damir Cosic, and Claire Xiaozhi Wang. Their test of a comfortable retirement was set at a 75 percent replacement rate, meaning retirees need 75 cents in monthly income for every dollar earned in their final decade of working. For this analysis, the researchers estimated retirement income at age 70 – an age when most people have already retired – for every individual in the federal data sources used in their analysis. They found that about a third of boomers and boomers’ parents don’t have enough retirement income to make that 75 percent cutoff. 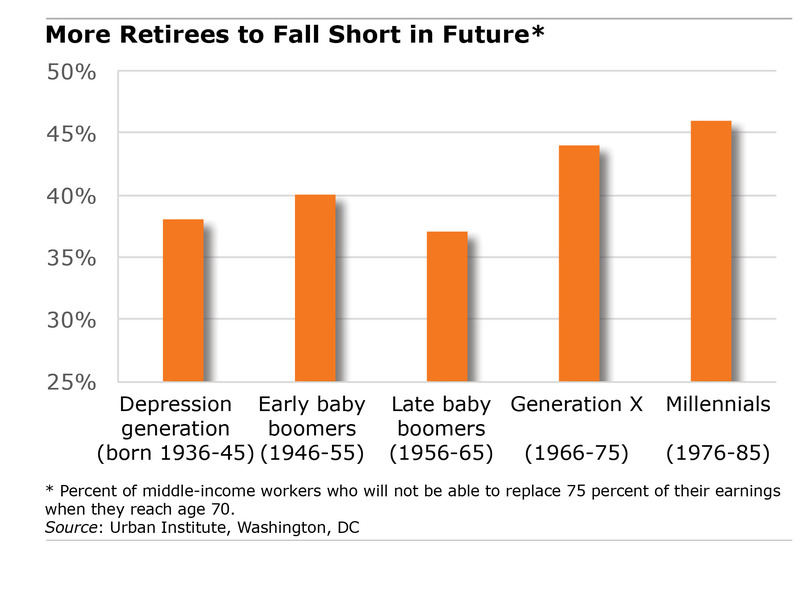 Millennnial households will be significantly worse off at age 70: nearly half are at risk. Mothers often work less because, well, they’re also moms. Still, they generally work consistently enough to qualify for Social Security pensions based on their own earnings records – rather than on their husbands’, as was common when more women were full-time housewives or worked just a few hours a week while the kids were at school. Yet today’s working mothers do take a hit to their earnings when they temporarily reduce their hours or take a hiatus from work for childcare. The upshot of lower earnings is less Social Security income later for mothers, according to a new study by researchers for the Center for Retirement Research (CRR supports this blog). During Boston’s mayoral election in November, Mayor Marty Walsh boasted that his administration has overseen $100 million in housing investment. Walsh’s challenger, City Councilor Tito Jackson, responded that this new investment has been dominated by the luxury apartments and condominiums sprouting downtown and around GE’s new headquarters in the booming Seaport neighborhood. Walsh retained his seat, but Boston’s housing debate is playing out from Orlando to Austin to San Francisco. “The lack of affordable rental housing is a consequence of not only increases in the number of lower-income households but also steeply rising development costs,” Harvard University’s Joint Center for Housing Studies concluded in its annual report on the nation’s housing stock. An unprecedented 1 million new renters have come into the market annually since 2010, the center said, fueled by well-heeled older couples and young professional couples with children pouring into luxury apartments and the single-family homes that are on the rental market. Building has slowed more recently, but not before strong demand had driven up the typical U.S. apartment rent by 27 percent, to $1,480, between 2011 and 2016. 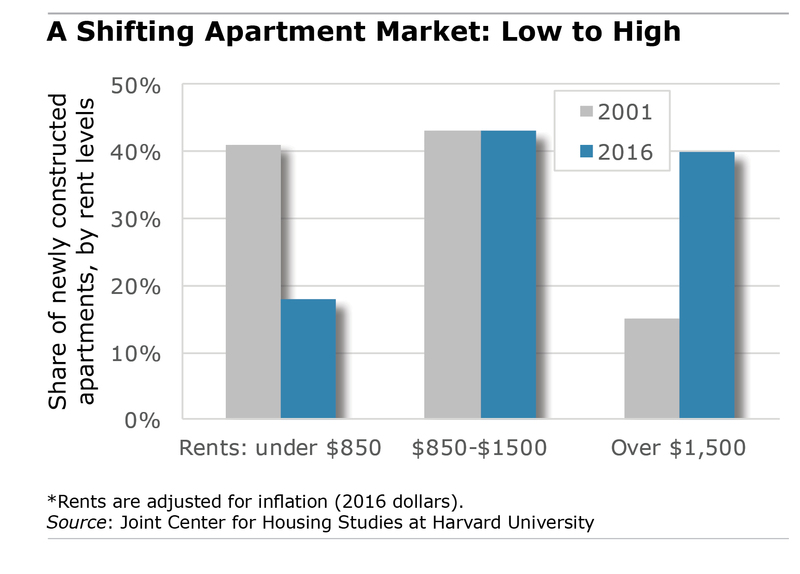 And $1,100-plus apartments leaped from one-third of the rental market to two-thirds; all rents were adjusted for inflation.